How was everyone's week? Mine was good, and I'm looking forward to the tennis finals at the Olympics this weekend. I really want Murray to win this one. I will definitely be staying up late to watch it. In the meantime my roommates and I are wasting away our afternoon by watching Doctor Who. Has anyone ever read 'French Women Don't Get Fat'? If you like healthy eating and clean eating, then you will like this book. The meals are a little restaurant-y, but very filling. It is not the typical 'clean eating' kind of diet, with lots of almond butter and chicken, and it includes meats, pasta and desserts. It is, I suppose, the old-fashioned clean eating diet. The book is very philosophical, it is more about developing a healthy approach to living - how to enjoy all types of food. One recipe from the book is Magical Breakfast Cream. I am not posting the actual recipe, as I am all for you buying the book and reading the original. But here is my modified version of the breakfast - it's a little more suited to my taste. I changed a few of the quantities but it is essentially the same. I swear by this breakfast - it is sweet, lemony, filling and when combined with the freshest fruit, makes a perfectly delicious breakfast. It is also really creamy - perfect when you're craving a yoghurt hit. And you totally can't blame me for the bad pictures. Have you ever tried to get good pictures of something that, let's be honest, looks a bit like a mess? It can't be done. 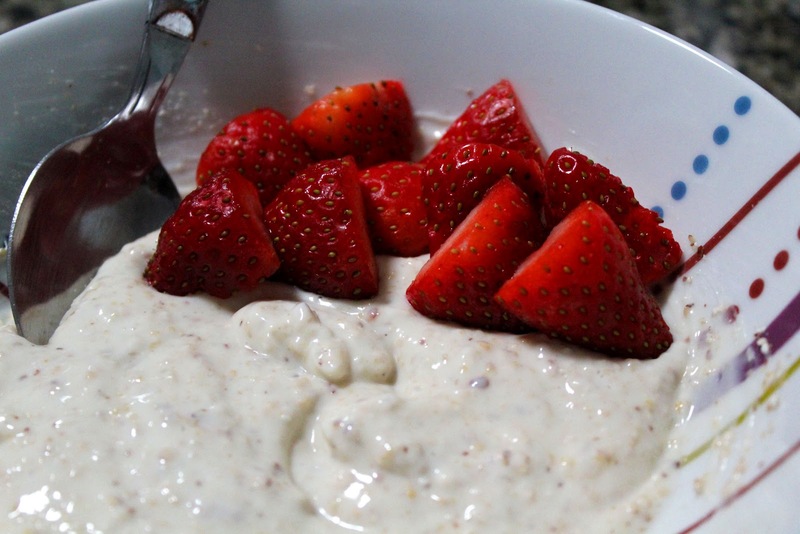 Menu Options: Serve this breakfast cream with any fresh fruit - mango, strawberries, blueberries, banana - really, anything. Also, if you don't want to use honey, other sweeteners will work. 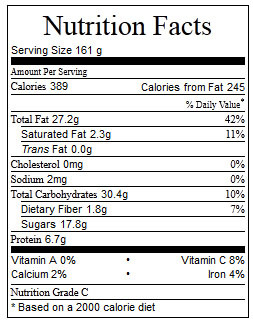 Nutritional stats calculated without fruit. In a food processor, finely ground the oats, followed by the almonds. Do the ingredients seperately. I often grind up a cup of both and then keep the ground oats and almonds in seperate containers in the fridge until I need the oats and almonds for the actual recipe. In a bowl, add the yoghurt. It is important to add each ingredient seperately - this is the wisdom of Mireille Guiliano. Add the oil and stir the ingredients together until the yoghurt has thinned slightly from the oil. Add the lemon juice and stir till well combined. Add the honey. This does not have to be completely mixed in though. Finally, add the oats and almonds, and mix well. Serve with seasonal fruit. I serve mine with strawberries, because I like the combination, but any fruit will do. It looks so creamy. I have heard of this book but never read it. may have to check it out now! Oh, this sounds great! 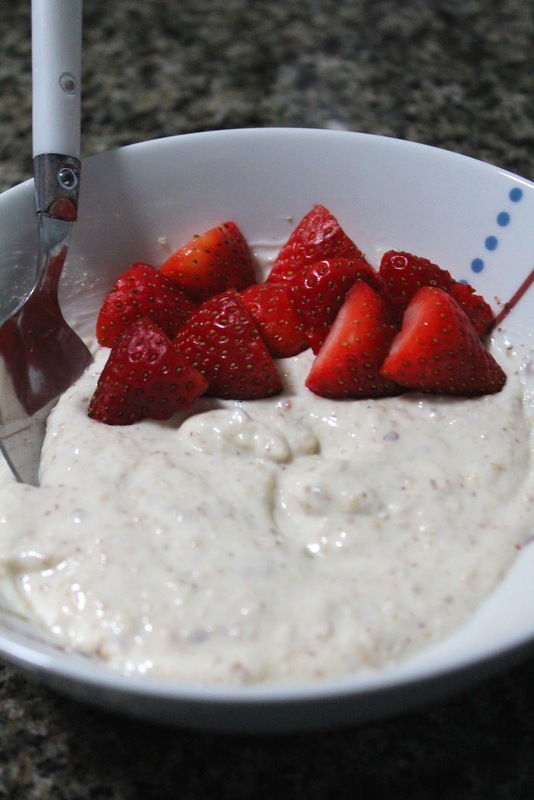 I am always looking for ways to mix up my morning oats!